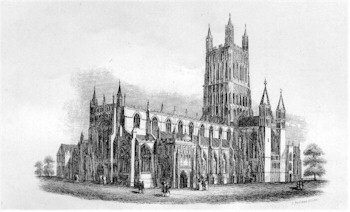 The City of Gloucester, Gloucestershire, England has a large number of places of worship. They range from the magnificent Cathedral to small Chapels. The information detailed below has been obtained from various sources, and is as complete as possible. In many cases my records only indicate when a church was in use - it may have been in existence for hundreds of years before that. Additional information or corrections, however small, are welcomed. The purpose of this, and every page on my site, is as a free resource for family historians. Additional information kindly provided by Mrs. Iris Love and Mr Philip Tory. NOTE. GRO =Gloucestershire Record Office. All Saints Church, Barton St. Built 1875 to the design of Sir Gilbert Scott. Damaged by fire, but rebuilt around 1895, it closed as a place of worship in 1989. Restored, it is now the Anglo-Asian Cultural Centre. Registers 1875-1986 lodged with GRO. The church was adjacent to Barton St. railway crossing. The railway line was closed sometime in the 1960's or 1970's and replaced by a road, Trier Way. Barton St. Methodist Chapel. Opened c1884. Demolished c1987. Elizabeth, wife of Nathaniel WASHBOURNE, 1839. Bethel African Episcopal Church, Painswick Rd. See Tynedale Mission Hall. Brunswick Rd. Baptist Chapel. Built 1821, rebuilt to provide greater accommodation in 1847 and again in 1872. 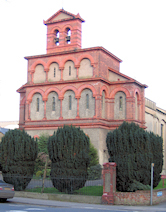 Re-opened in 1873, built on site of previous chapel. In 1884 the Raikes Memorial Hall was built alongside. Both were demolished in the 1970's. Brunswick Baptist Church was built in 1973 in Southgate Street as a replacement for the original building. Cathedral, Church of St. Peter and the Holy and Indivisible Trinity. One of the finest cathedrals in England. The site has been used as a church from 679. Building of the present structure commenced in 1089 and continued until around 1120, although the church was consecrated in 1100. The tower was commenced in 1450 and completed around 1460. King Henry III was crowned in the Cathedral in 1216, when he was only nine years of age. Robert, Duke of Normandy (died 1134). He was the eldest son of William the Conqueror, and was buried in the Cathedral. King Edward II, murdered in Berkeley Castle in 1327. His tomb can be found in the North Ambulatory and one of the windows in the south wall illustrates his murder. The East window, the largest in England. which dates from 1349, commemorates the participation of local knights in the Battle of Creaky (1346) and the Siege of Calais (1347). Dr. Edward Jenner (1749-1823), discoverer of the smallpox vaccine. Ivor Gurney (1890-1937). A plaque dedicated to the memory of the composer and poet is in the nave arcade. Building commenced in 1822 and consecrated in 1823. Registers 1823-1963 are lodged with GRO. Church of the Good Shepherd, Derby Rd., at junction with Sidney St. Designed by Waller & Son. Opened in 1892. Sold to the Ukrainian Greek Catholic Church in 1974. Coney Hill Methodist Chapel, Coney Hill Rd. Opened before 1934. Sold to Salvation Army 1955. East End Tabernacle. Derby Rd., Shown on a 1901 map, still in use in 1951. Demolished sometime prior to 1999 and replaced by houses. Situated virtually opposite the Church of the Good Shepherd. First County Lunatic Asylum Chapel (later Horton Road Hospital Chapel), Horton Rd. A chapel existed before 1852. A new chapel was built in 1873. This chapel remained in use until the early 1980's when it was changed into offices. Still in use as offices 1998. Gloucester National Spiritualist Church, Brunswick Square. In existence 1998. Holy Trinity and Blessed Virgin Mary Church, Longlevens. Consecrated 31 March 1934. Registers 1898-1957 lodged with the GRO. Hucclecote Methodist Chapel, Carisbrooke Rd., Hucclecote. Opened 1929. Replaced Hucclecote Wesleyan Chapel. Hucclecote Wesleyan Chapel. South side of Ermin St., opposite Hillview Rd. Built in 1848 and designed to a classical style by John Jacques. Most of the cost was borne by William Wingate, the builder. Demolished in 1929 when the congregation moved to the the larger Methodist Chapel in Carisbrooke Road. The cemetery adjacent to the chapel remains. Mariners Church, The Docks. Built 1849 for the crews of vessels moored in Gloucester docks. Also used by people from Gloucester. The church still holds regular services. Registers 1849-1929 lodged with the GRO. Melbourne St. Methodist Chapel. In existence 1898. New Testament Church of God. Stroud rd., nearly opposite junction with Seymour Rd. In existence 1999. Northgate St. Methodist Chapel. Also called Northgate Wesleyan Chapel. Facing Worcester St. Original chapel built 1787, enlarged 1839. This chapel was behind other buildings. Old chapel demolished and replaced by new about 1878, with ornate appearance. Closed early 1970's, demolished and replaced by a supermarket. Congregation joined with St. John's in a sharing agreement. Park Street Mission Room. The Society of Friends bought two cottages in 1678 for use as a meeting house. These cottages are still in existence 2011, named the Park Street Mission Room. See Friends Meeting House. Park Street Mission is a small but active church. See Park Street Mission [external web site] for further information and location map. Prison Chapel, Barrack Square. In use before 1881. Ryecroft Methodist Chapel, Conduit St., corner of Falkner St. Built 1870, opened 1871, closed 1955. Originally called the Ryecroft Wesleyan Chapel. Designed by A.W. Maberley, with twin towers above the entrance. Inside it had a gallery on three sides. After 1955 used as annexe to Gloucester College of Art. See Stroud Rd. United Methodist.